Identify the URL of your Trailhead profile. Make sure you are not copying URL of success community. Below image shows steps to get Trailhead URL. We just need end part of URL, after last forward slash. As shown in below image, just replace white part by your ProfileId and paste code in your website. div tag would be replaced by widget content. Feel free to provide feedback and suggestions !!! 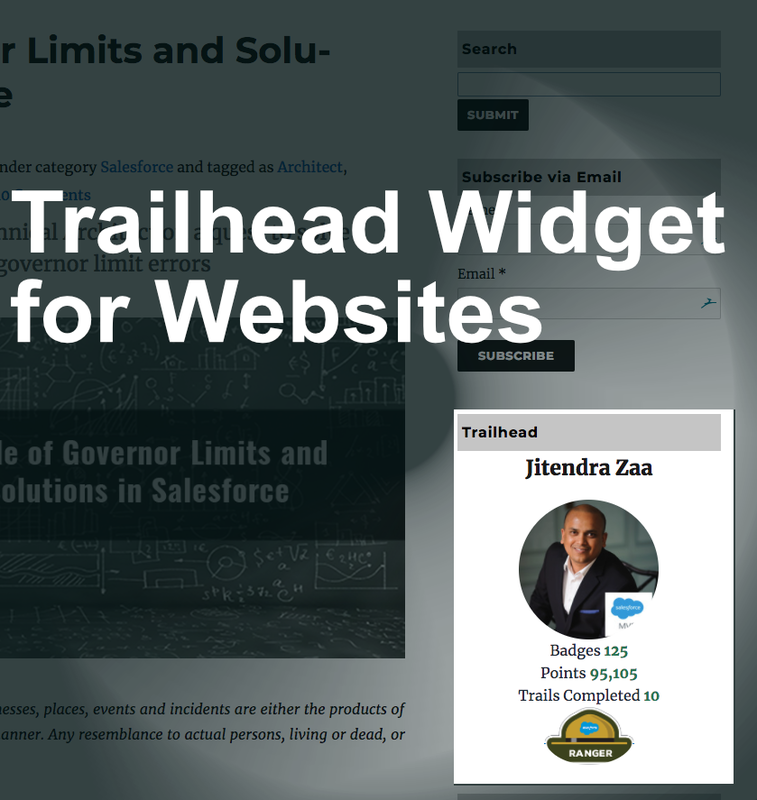 I have incorporated Trailhead Widget at my website santanuboral.blogspot.com. It looks nice! Thank you. I have gone through your Salesforce Single Sign On (SSO) using Janrain blog. I have tried to Salesforce Single Sign On (SSO) with Instagram but I got the error NO_ACCESS:Unable to find a user. Can you please help me into this. What about the Profile that has done Vanity URL. I dont have profile id. It has something like this so what to do in this case? This is post is having awesome content. But while using this code into my wordpress site I am not able to add the widget it just showing me the spinner. My site is using free version of the wordpress is that the Problem? Hi Amit, whats code you are using. Can you paste it here. It seems there was issue between http and https – mixed content. You site might be on https and my site had URL of http. Its been fixed now, please use updated code. What is Data Protection and Privacy in Spring 18. How can use and Track Data . Plz Help. Nice work. I am just did you use API? how you get the x-api-key?